New Tehri is the district headquater of Tehri Garhwal. It is situated at an elevation between 1550 to 1950 mts. Above sea level. A modern and well planned town, only 11 Kms. From Chamba & 24 Kms. From Old Tehri, it overlooks a massive artificial lake and a Dam. This places is become great attraction for tourists. 14 kms. away from Muni-ki-Reti at an altitude of 1,129 m lies this capital of the former king of Garhwal.Until a few years ago it was the headquarter of the District Tehri Garhwal, but now the New Tehri Town is the headquarter. Here, the palace of the Tehri Raja, is situated amidst a forest. Situated on the main Rishikesh-Gangotri-Yamunotri route, Narendra Nagar offers a fine view of the Ganga and the beautiful Doon Valley. The sun set view from here is particularly attractive. Hotels and the P.W.D. Inspection House offer accommodation. 60 km. from Mussoorie and 48 kms. from Narendra Nagar on the road to Gangotri. Chamba is a township lying high at an altitude of 1676 m, offering a splendid view of the snow-capped Himalayas and the serene Bhagirathi valley. Chamba happens to be a focal point, being located at the junction of roads leading from Mussoorie, Rishikesh, Tehri and New Tehri. The Chamba- Mussoorie fruit belt is also famous for its delicious apples. 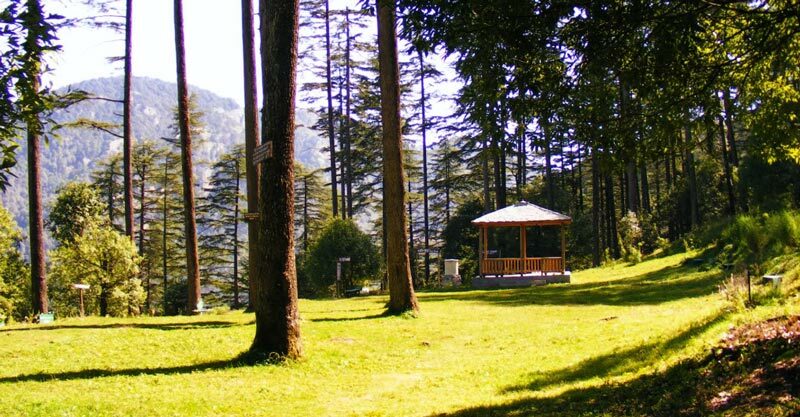 Dhanaulti, located amidst thick, virgin forests of Deodar, Rhododendron and Oak, has an atmosphere of perfect peace & tranquility. The long wooded slopes, relaxed outdoors, cool crossing breeze, warm and hospitable inhabitants, lovely weather and fabulous view of snow covered mountain makes it an ideal retreat for a relaxed holiday. Situated on the Mussoorie-Chamba route, Dhanaulti is 24 km from Mussoorie and 29 Km from Chamba. Kunjapuri is the name given to a peak having an altitude of about 1,676 m. It lies in Lat. 30`11` N. and Long. 78`20` E., about 93 km. from Devaprayag and 7 km. from Narendra Nagar. It commands a beautiful view of the snow-ranges of the Himalayas and of the valley of the Bhagirathi. It contains an old temple dedicated to the goddess Kunjapuri Devi which is visited by a number of people every year. Nearby, in Agarakhal, there is a dak bungalow situated in picturesque surroundings and mantnained by the public works department. Kunjapuri is said to be one of the sidddhapeeths established in the region by Jagadguru Shankaracharya and legend has it that the upper-half of the body of Sati, wife of Siva, fell here when Siva was carrying it to Kailash after Sati had flung herself in the yajna fires when some derogatory remarks were made about her husband by her father Daksha. This temple is situated at the confluence of the Bal Ganga and Dharam Ganga rivers, at a motorable distance of 59 km from Tehri. It is believed that Duryodhan offered tarpana here. According to legends, it is at this temple that the Pandavas encountered Rishi Balkhily at Bhrigu Parvat when they were on the lookout for Shiva after the Kurukshetra battle. The Rishi directed them to the site of the confluence to meet an old man meditating there. But when the Pandava got there, the old man vanished and instead, a shivling appeared there. Rishi Balkhily instructed the Pandavas to embrace the Shivling in order to free themselves from their sins. Their impressions are stamped on this Shivling – the biggest Shivling in northen India. Situated at the confluence of the Alaknanda and the Bhagirathi, the town of Devaprayag lies at an altitude of 472 m. on the metalled road running from Rishikesh to Badrinath and about 87 km. from Narendra Nagar. Near the town there are two suspension bridges, one each on the Bhagirathi and the Alaknanda. The metalled road to Badrinath crosses the former by a third bridge. The town is the headquarters of the tehsil of the same name and is one of the five sacred prayags (confluences) of the Alaknanda. Tradition has it that the town is named after Deosharma, a sage, who led a life of penance here and succeeded in having a glimpse of God. The great temple of Raghunathji is claimed to have been erected some ten thousand years ago and is built of massive uncemented stones. It stands upon a terrace in the upper part of the town and consists of an irregular pyramid capped by a white cupola with a golden ball and spire. Religious ablutions take place at 2 basins excavated in the rock at the junction of the holy streams – on the Bhagirathi known as the Brahm Kund and the other on the Alaknanda called the Vasisht Kund. The temple, along with the other Buildings of the town, was shattered by an earthquake in 1803 but the damage was subsequently repaired through the munificence of Daulat Rao Sindhia. The temple is visited by a large number of pilgrims every year. The town is the seat of the pandas of the Badrinath Dham and possesses a post and telegraph office, a public call office, a police out-post, a dak bungalow of the public works department and a hospital. Besides the temple of Raghunathji, there are in the town Baital Kund, Brahm Kund, Surya Kund and Vasisht Kund; the Indradyumna Tirth, Pushyamal Tirth, Varah Tirth ; Pushpavatika ; Baitalshila and Varahishila ; the shrines of Bhairava, Bhushandi, Durga and Vishveshvara ; and a temple dedicated to Bharata. A bath at Baithalshila is claimed to cure leprosy. Nearby is the Dasharathachal Peak, containing a rock, known as Dashrathshila, on which Raja Dasharath is said to have led a life of penance. A small stream, the shanta running down from the Dasharathachal, is named after Shanta, the daughter of Raja Dasharath and is considered to be sacred. At a height of 2903 m, situated in the interior of the district, the temple of Nag Raja at Sem Mukhem is held in high esteem by the people of the area. Transport facilities are available up to Khamba Khal, a distance of 64 kms. from Tehri. One has to walk for about 7 kms. from the Khamba Khal to reach Sem. The temple is situated at the top of a hill about 5 kms. from the village Mukhem which is 2 kms. from the motor head of Khamba Khal. Accommodation is provided by the ‘Pandas’ of the village Mukhem . The Surkanda peak lying at an altitude of 2,750 m. in the western part of tehsil Tehri, and is famous for the temple of Surkanda Devi. It is about 8 km. from Dhanolti on the motor road running from Mussoorie to Chamba and is connected with Narendra Nagar which is about 61 km. and with Tehri which is about 41 km. by motor roads. To reach the temple one has to leave the Mussoorie-Chamba road at Kadu Khal and climb a steep ascent of about 1.5 km. on foot. The legend is that Sati, the wife of Siva, gave up her life in the yajna started by her father. Siva passed through this place on his way back to Kailash with the dead body of Sati whose head fell at the spot where the temple of Surkhanda Devi stands. It commands a beautiful view of Dehra Dun, Rishikesh, Chandrabadni, Pratapnagar and Chakrata. Flowers of varied kinds and colours and indigenous herbs grown in abundance here and some of the beautiful birds of the western Himalayas are also found in the neighbourhood. A local fair is held on the occasion of Ganga Dasahra in Jyaistha when hundreds of devout pilgrims visit this place. The Chandrabadni a mountain (2,277 m. above sea-level), lying in Lat. 30* 18′ N. and Long. 78* 37′ E.,on the border of tehsil Devaprayag and Pratapnagar is well known for the temple of Chandrabadni Devi which lies at the top of the mountain about 10 km. north of Kandi Khal ( a place on the Devaprayag-Kirti Nagar metalled road), 22 km. from Devaprayag and 109 km from Narendra Nagar. It is said that when sati, the wife of siva,gave up her life in the yajna started by her father and siva was carrying her body to Kailash, her torso fell here. There are some old statues and lots of iron trishuls (tridents) outside the temple. It comands a beautiful view of the Sirkanda, Kedarnath and Badrinath peaks. The temple here is very small and contains a Shri-yantra carved out on a flat stone instead of any idol. Traditionally, a cloth canopy is tied to the ceiling over this Shri-yantra once a year and the Brahmana priest doing it has to do it blind-folded. For those who are interested in trekking and adventure, Nagtibba offers them all the opportunities. The area is full of dense forests and natural beauty. One can have a panoramic view of the Himalayas. Thatyur is the base camp for visiting the place, it is away from Chamba-Mussoorie road for which road branches off from Suwakohli a place about 16 km from Dhanolti. From here Thatyur is 23 kms. Situated in the valley at the bank of river Algar. The trek starts from here, via Dewalsari, a place 7 kms. Whereone can stay in the forest rest house. From Dewalsari Nagtibba is 14 kms. Situated at an altitude of 3048 Meters and other glaciers is most spectacular and alluring. From here Masartal is 7 kms. The route further up goes to basukital and from there to Kedarnath. The trek for Khatling glacier starts from Ghuttu, a place about 62 kms. from Tehri. There is a P.W.D. Inspection house and a Tourist Rest House at ghuttu. The other important places enroute are Reeh, Gangi, Kalyani & Bhomakgufa. At Reeh & Gangi Tourist Rest Houses are available. Gangi is the last village beyond which no facilities of any kind are available and one has to make its own arrangements. The singht of the khatling glacier is most spectacular and alluring. From here Masartal is 7 kms. The route further goes up to basukital and from there to Kedarnath.